A Royal Marine who died after a gunfight in Afghanistan has been named by the Ministry of Defence as Steven James Birdsall, from Warrington. The 20-year-old was shot on Sunday and died on Monday in a UK hospital. His family said he was "selfless, brave and fearless". His commanding officer called him the "perfect marine". He was the 296th member of the UK Armed Forces to die in Afghanistan since 2001. Two soldiers from the Duke of Lancaster's Regiment died on Tuesday. They were shot dead in separate incidents in the Nad Ali district of Helmand province. 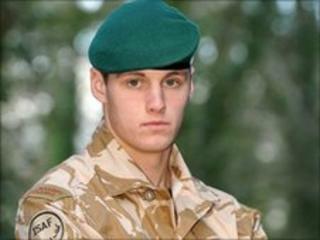 Marine Birdsall, of 40 Commando Royal Marines, was shot by insurgents while providing security for a company of Royal Engineers working at a checkpoint in the Sangin area. He was transferred to Selly Oak Hospital in Birmingham, but died later from his injuries. His family said: "There are no words that could ever express the heartache of losing our beautiful son, Steven, who was always so selfless, brave and fearless. "Steven had so many friends back home in Warrington and in 40 Commando Royal Marines, and we are forever thankful to the lads who were with him when he needed them most." He joined the Royal Marines in 2007, aged 18, and deployed to Afghanistan in April this year. His commanding officer, Lt Col Paul James, said he had "a sharp mind and a big and generous heart". "He was a consummate professional, forever focused, very proud and utterly dependable, yet always cheerful and magnanimous. "He was the perfect marine." Marine Birdsall was also a talented footballer and colleagues said one of his proudest moments was winning an impromptu beach tournament in Cancun, Mexico, leading a team made up of fellow marines. Defence Secretary Dr Liam Fox also paid tribute to him: "Marine Birdsall has given his life helping to deliver real progress in Afghanistan, which is at the heart of our efforts to protect security in the UK. "His colleagues speak of a brave, strong and dependable marine. I extend my deepest condolences to his family and loved ones."